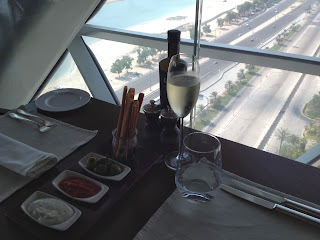 A year ago, around this time, I tried the brunch at 18°, the signature restaurant at Hyatt Capital Gate, Abu Dhabi. I remember leaving with a satisfied feeling. My experience this time was the same, and undiminished. The first thing that strikes you as you enter the hotel is the space. The ground floor entrance, though, does not actually take you to the lobby of the hotel. 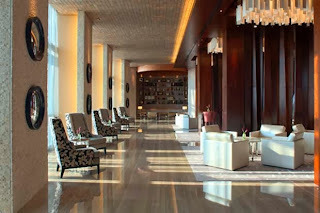 The lobby is found on the 18th floor. However, on the ground floor you will find a rather soulless cafe, Profiterole. Now I have been to this Hyatt on about 5-7 occasions and I am yet to find a customer/guest at this cafe. I often wonder how these cafes contribute to a hotel's bottom line. Anyway, I spent about half an hour killing time by reading a book before going up to the 18th floor for brunch. 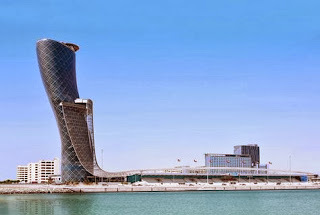 Splendid architecture that is the Hyatt Capital Gate. The Lounge, adjacent to 18°. On the 18th floor, the lift opens to reveal the lobby lounge, reception on the left and 18° on the right. The name 18° ? The angle at which this impressive building leans. Well, 18° has even fewer dishes and those used to the endless variety at other brunches might be disappointed with the spread here, but I was not disappointed. It did feel great knowing that there was quality on display. Briefly, the spread is too small to talk about 'stations'. 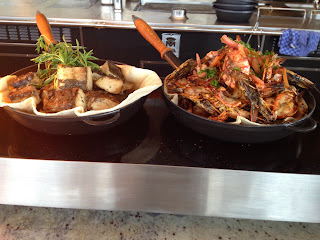 The grill station, for want of a better expression, features some grilled vegetables with lamb, beef and fish next to it. 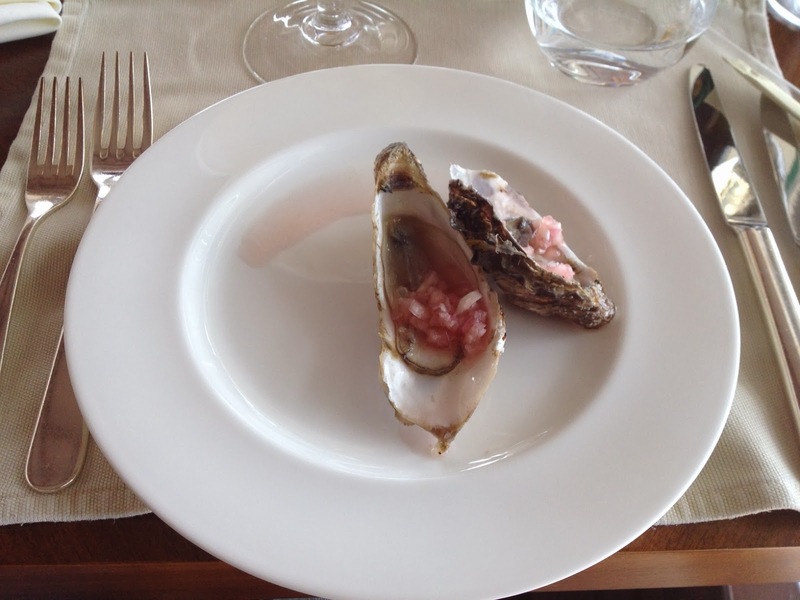 The seafood, modest but fresh, consists of salmon, mussels and oysters. 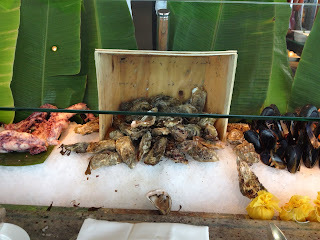 The French oysters were shucked very well, making it an all-round wonderful seafood experience. If there is a disappointing aspect, it would be the salad section, which is too modest. I felt a decided lack of green, leafy options. . 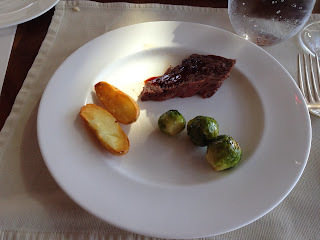 The Australian lamb was an absolute highlight, just as it was a year earlier. The beef, though, was even far superior and I felt compelled to have seconds. The drinks are fairly standard at these affairs. The wine served, the Argentinian Fuzion brand, made a welcome departure from the usual Australian wines that one gets as part of the middle range drinks package. Since moving to Abu Dhabi, the Malbec has become one of my favourite varietals! Maybe I got lucky with the bottle that had been opened for me but it was superb considering the price. I enjoyed equally the Proseco that is the standard one served at this Hyatt and I enjoyed on previous visits to their cheese and wine evenings. 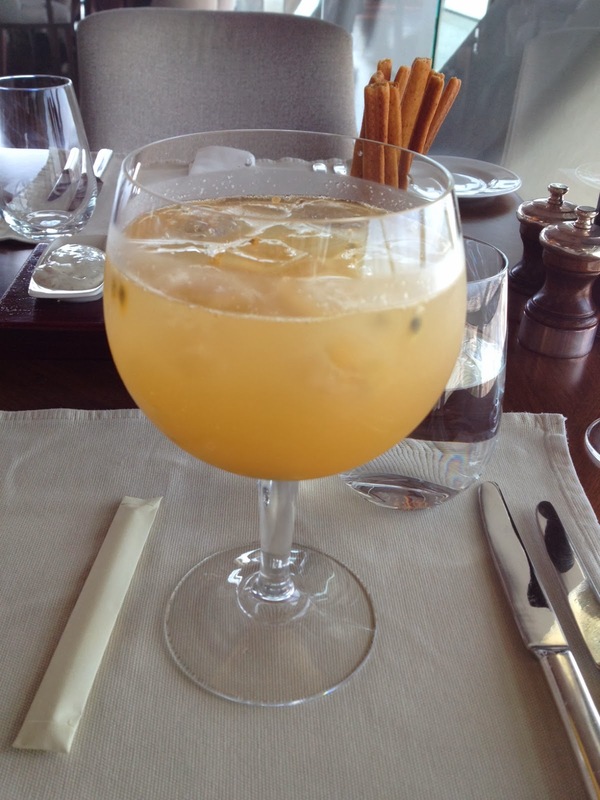 I also entered unchartered waters when I ordered a passion fruit and vodka cocktail. It just looked like Summer had begun and I had to have it. I could it feel it was going to curb my enjoyment of the Proseco, so I stopped midway. Too much vodka for me! 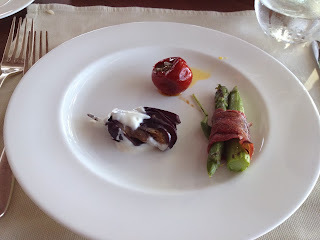 Asparagus wrapped in beef, peppadews stuffed with olives and egg plant in white sauce. Apart from the salads on offer, you might be disappointed with the dessert area which is very modest indeed. Your ubiquitous cheesecake varieties and ice cream were on offer, but I gave them a miss. I also think it is not as child-friendly as other brunches who have a dedicated children's station. I don't have a problem with this personally because my daughter has mature eating habits, but if its fries and nuggets you want, this is not the brunch for your kids. However, they do make great pizza kids! 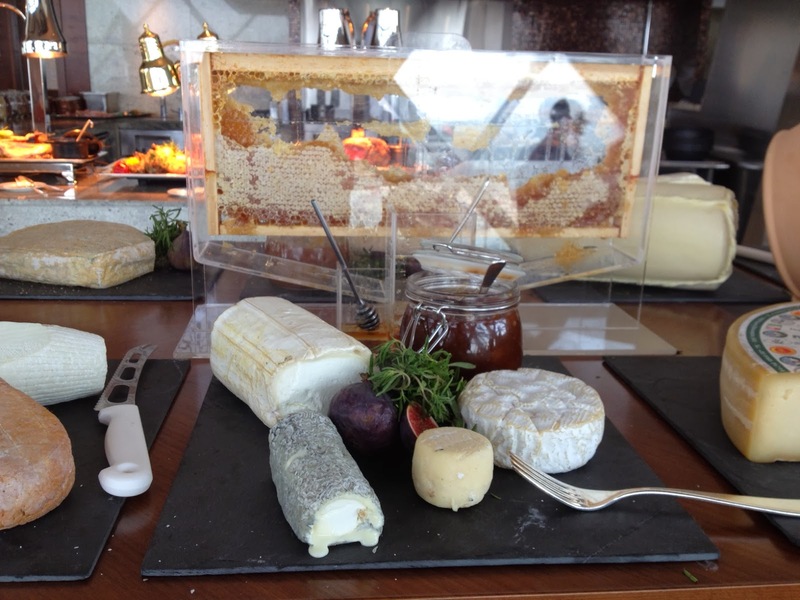 Fantastic cheese 'station', a great precursor to the Wednesday evening Cheese and Wine. 18° is a great place. 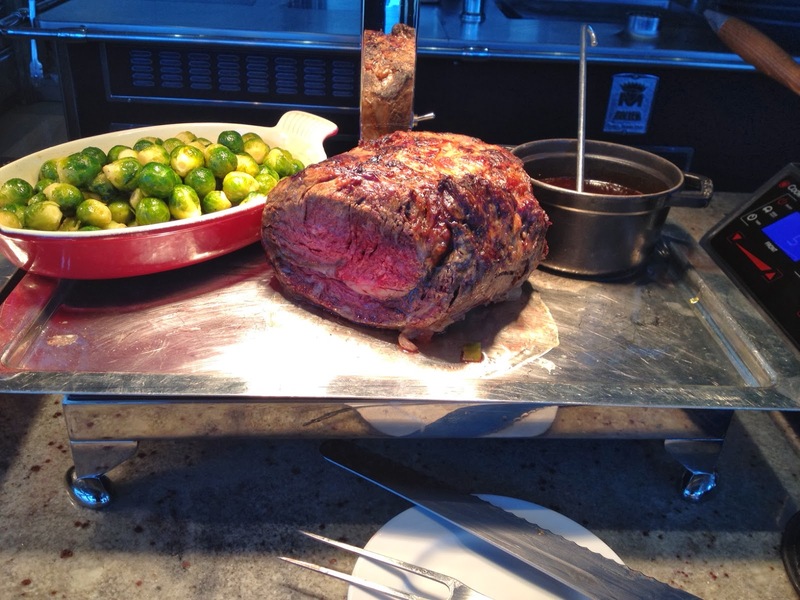 The food, first and foremost, is outstanding. Secondly, it is hip and cool without being uber cool where you feel out of place because you still listen to CDs! By the way, I also noticed many people dressing up. I like it that there are still places in this world where elegance is not out of place. 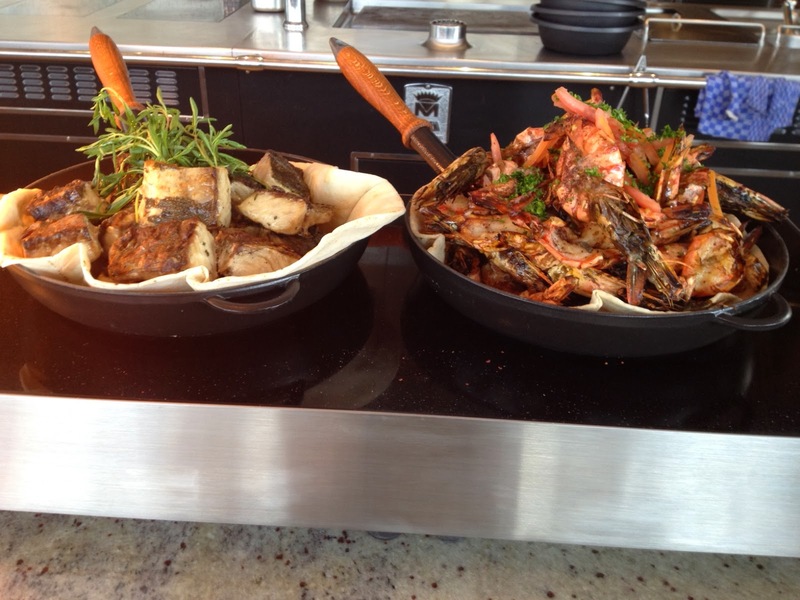 This is definitely a brunch you should check out. If it's, as the cliche goes, quality and not quantity you are after, this is for you.